So smart and still casual. Great easy fit around the belly because they are elasticated. They look really cool and very different! Lovely smart pin stripe material that is easy to style Loose fit, roomy pockets. Lovely! I ordered size XL (around a size 16) (I am a size 14 - 16) but they were a bit too big for me (unusually because Ganni clothing usually comes up smaller on me....). I so wanted to love them but in the end decided to return them as they just didn't look quite right. The shorts are well made and finished with lovely pockets too. But if you have a thick waist as I do then the paper bag elasticated top makes you look larger. I also thought they were a little heavy for summer wear - better for the autumn, perhaps with tights? 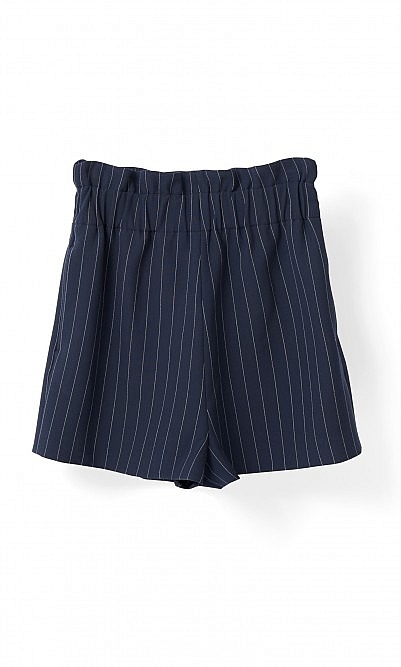 Very, very flattering shorts, they look good enough to wear to a wedding. Super comfortable and the fabric is such good quality. Bought them 4 weeks ago - but on a positive note, they are fabulous and I have worn them lots!! !